36). wine a whole night with gross sinnamon in an Earthen vessell, close Stopped on the morning distill it. That water is very good for the Stomack. Surfits Water. Take a Galloon of the left aqua vitae, a pint of damask rose water, put into the Rosewater a ount of whole Sugar Candy Findly beaten Soe let it Steep 24 houres. 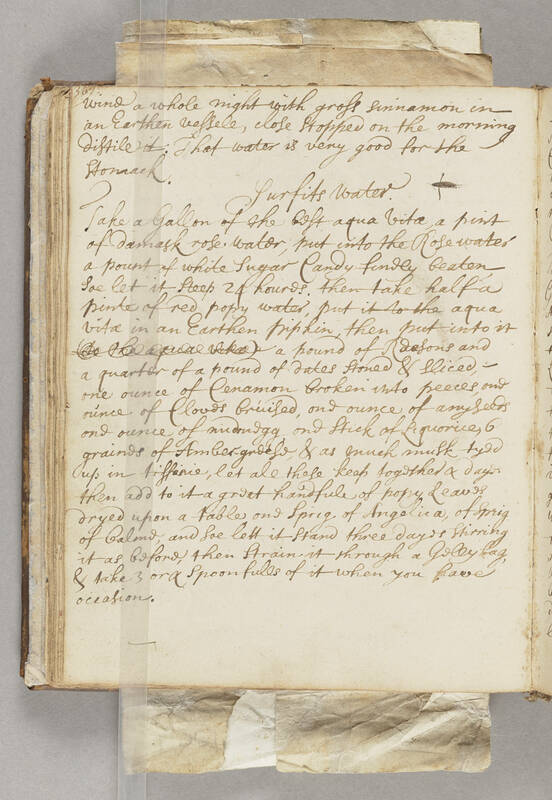 then take half a pinte of red popy water, put aqua vitae in an Earthen pipkin, then put into it a pound of Reasons and a quarter of a pound of dates Stoned & Sliced, one ounce of Cenamon broken into peeces, one ounce of Cloves bruised, one ounce of anyseeds one ounce of nudmegg, one Stick of Liquorice, 6 graines of Amber-grease (i.e. ambergris), & as much musk tyed up in tiffanie, let all these keep together 4 dayes then add to it a great handfull of popy Leaves dryed upon a table one Sprig of Angelica, of (i.e. one) Sprig of Calme, and Soe lett it stand three dayes Stirring it as before, then Strain it through a Gelly bag, & take 3 or 4 Spoon fulls of it when you have occasion.